When the old organ in Gray's Inn Chapel was built, it employed electric action which at the time was felt to be the way that the organ of the future would develop. In time, it became evident that organs which employed electric action had a limited life-span, just as domestic equipment such as radios or washing machines which often contained similar technology. Thirty years is a quite normal life-span of such electric action organs before extensive work needs to be undertaken. In addition, organists have discovered over the years that they were missing something by losing the direct connection the older mechanical organs had between the keyboard and the pipes. So after due consideration of the options of rebuilding the old organ, or building an essentially new instrument employing some of the old material, it was decided that there should be no element of compromise and that an entirely new organ should be built. By starting with a clean slate, an organ could be built which would serve the music of the Chapel in every way possible and it could also enhance the building architecturally. It employs sensitive suspended action. This form of action affords the player optimum control and sensitivity when played. It also has the undoubted advantage of longevity. Every effort has been made to ensure that the new organ suits the Chapel. 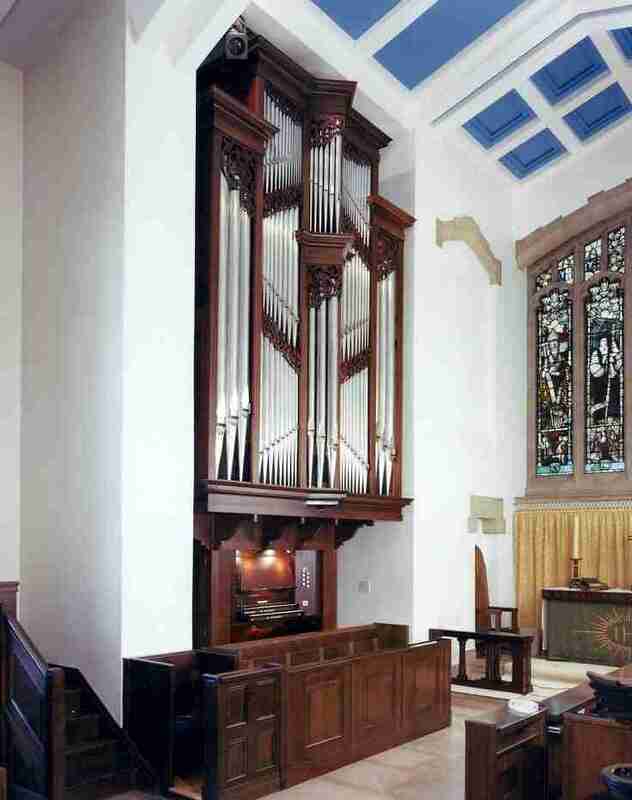 The casework has been made in North American hard maple to match the furnishings; the organ was voiced in the Chapel to ensure it sounded absolutely right in its permanent surroundings and the very best of design and materials has been employed in the organ's construction. The keys are of bone and ebony. The stopknobs are of rosewood and the front pipes are of 75 per cent tin. In spite of its modest size, the compass of the organ is 61 notes to the manuals and 32 notes to the pedals, reflecting the resident organists particular interest in contemporary music. For reasons lack of space, the Pedal Principal, Stopped Flute and Trumpet are transmitted mechanically from the Great organ. The new organ should serve Gray's Inn Chapel well for many generations to come.